Weight loss in obese elder patients can be detrimental to their health, but dietitians can take certain steps to help them lose weight appropriately and healthfully to improve their quality of life. The prevalence of obesity in the United States is increasing among all age groups, including adults aged 65 and older. The most recent findings from the National Health and Nutrition Examination Survey (NHANES) found that more than one-third of this population segment is obese. 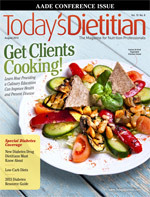 Today’s Dietitian spoke to RDs who have experience working with elder patients who are overweight or obese. Here they discuss the perils of overweight and obesity in this population and share the safest and most effective treatment options to improve their quality of life. By 2050, the number of US older adults is expected to more than double, rising from 40.2 million to 88.5 million, according to the US Census Bureau. One reason obesity in the older population is getting more attention is because aging and obesity contribute to the increased use of health care services, which compounds health care spending. There are several factors that contribute to obesity in the aging population. Some individuals always have been overweight or obese and have simply carried those extra pounds into their older years. But a key reason some individuals become overweight or obese as they age is the decrease of their caloric needs and physical activity. Vandana Sheth, RDN, CDE, a spokesperson for the Academy, says that in addition to decreased activity, reduced growth hormone and testosterone levels, poor nutrition, medications, hypothyroid disorders, and lower metabolic rates are some additional factors that can cause weight gain and contribute to obesity in older adults. As dietitians begin developing weight-loss diet plans for elder clients, there are other special considerations that may come into play. As discussed, medication and medical history are two key concerns. But it’s also important to note that older adults occasionally have naturally occurring loss of taste or difficulty chewing that can make adhering to certain dietary recommendations challenging. This is significant because it can hinder the amount of protein they consume, particularly if they get most of their protein from meat. This is concerning because protein is critical for maintaining the immune system and rebuilding muscle mass. It’s essential to assess whether older clients have barriers to getting adequate protein and develop solutions. The cost of protein sources is another concern for many older adults, which may be a reason they begin to eat less meat, Crandall says. Some clients may need assistance in finding less expensive protein sources, such as beans and eggs. Or if loss of taste is the reason they’re eating less protein, they may need helpful suggestions in making their protein options more flavorful. Because older adults who are overweight or obese have unique nutrient and dietary needs, it’s important for dietitians to form partnerships with local physicians, Salge Blake says. If primary care physicians are recommending these patients lose weight, they also should recommend they seek the assistance of an RD.